Transcript: Welcome to MyBinding video. This video is designed to help you understand plastic comb binding and the machines and systems used to do it. Comb binding is both inexpensive and simple; you can bind books of up to 425 sheets in length. Welcome to MyBinding video. This video is designed to help you understand plastic comb binding and the machines and systems used to do it. Comb binding is both inexpensive and simple; you can bind books of up to 425 sheets in length. The first step in comb binding is punching. Plastic combs use a 19-hole punch pattern. Not all machines have the same punch capacity; it's a consideration you'll want to take when purchasing a system. Once you've punched, the second step is binding. When purchasing a machine, you'll want to look at how the comb opener works and how easy it is to thread your document onto the comb. Plastic comb binding systems work very similarly but they are all a little bit different. Here at MyBinding, we strive to make a demo video for every unit that we sell. That way you understand the process and the features on each machine, such as depth of margin control. Some machines allow for this to be adjusted, making for stronger margins on larger documents. Almost every machine has side margin control of some sort. This allows for consistent and centered punching throughout your entire project. Disengageable die pins is a great feature that allows you to process virtually any length of paper. And then you'll need to make a decision between electric or manual punching. Large workloads can get pretty tedious with manual punching. When it comes to size and price, the range is wide. Some units are designed for small workloads or for great portability. They work well for the home office, for the occasional use, and for the road. They can cost as little as under $30. But as production needs go up, so do the size and price and versatility of different machines. Some machines are quite stylish and fashionable, some stow away really nice in your office space. Most of the systems are all and one, with punching and binding capabilities. Price range on these are under $100 to a few hundred dollars. For larger and more industrial productions, there are modular units built on base systems, so you have punching and binding as separate equipment. For higher production, you can have more than one operator or stack the machines together and use it as one. Very heavy duty, industrial, and long lasting, the price range can go from one up to five thousand dollars. So regardless of your workload and needs, MyBinding has the machine for you. 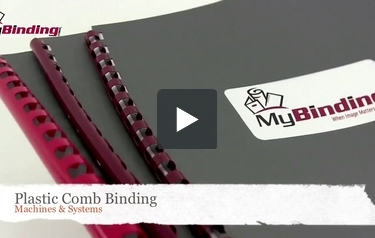 Check out more videos of demos, reviews, and how-tos at MyBinding.com.